All of us who live or travel in Wayne County in western New York State know it is easier to travel north-south than east-west. Most of us know that is due to the elongated hills called drumlins that cover much of the region. And we also know that those geomorphological features were formed by the continental glaciation that covered western New York with ice a mile thick until their final retreat 12,000 years ago. BUT, did you know that until very recently, glacial geologists could not agree on exactly how these elongated parallel hills came into existence. 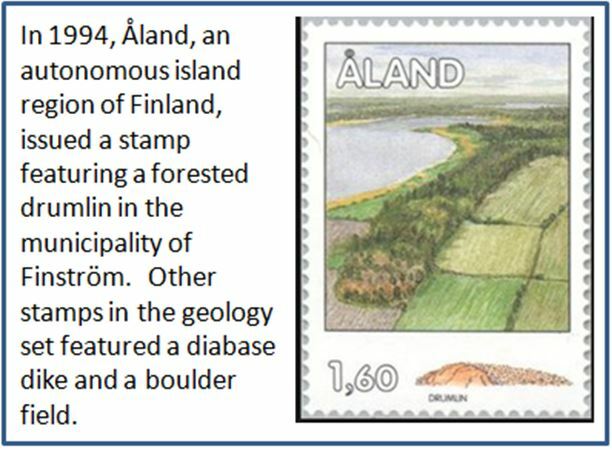 It was known that the drumlin fields were aligned with the glacial flow and retreat, but it was unclear whether they represent debris built up progressively during glacial advance and retreat or whether they were sculpted out of older sediment from previous glacial deposits. The debate has raged for over 150 years. Well, a team of scientists from the University of Toronto Scarborough appears to have solved the dilemma (Eyles et. al., 2016). They deployed airborne high resolution ground-penetrating laser technology combined with advances in absolute GPS positioning to map depth to bedrock beneath soils, trees, and water. They found that drumlins are “islands” of sediment left behind as the intervening regions were washed out by rivers and streams coming off the retreating glaciers. The drumlins themselves are rooted in bedrock suggesting that not only was intervening glacial sediment removed, but ice streams with embedded rock and later rivers and streams also cut down into the Paleozoic bedrock. 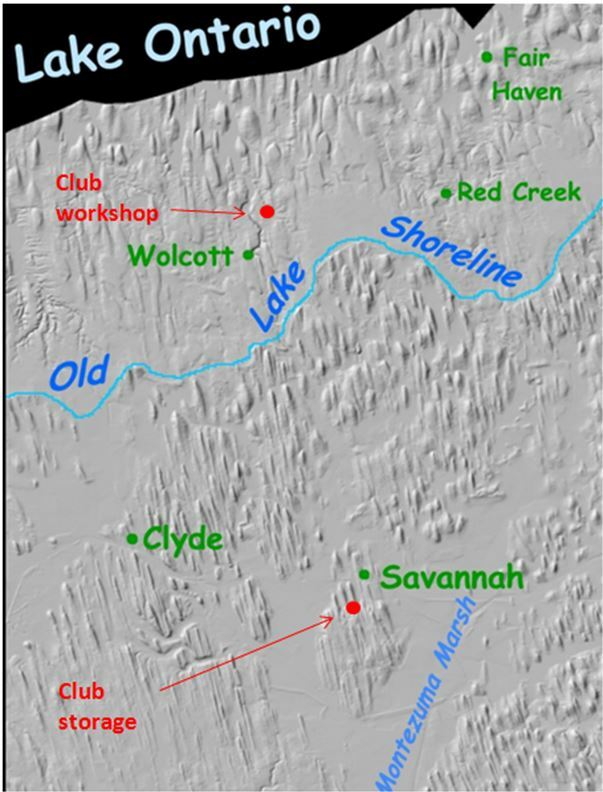 This enhanced the topographic extremes between the drumlin ridges and the valleys. If you are bored, you can try to count the drumlins in this portion of Wayne County. Our area is so well known for its drumlin fields (often called swarms) that this shaded relief image map (sans the location of the WCGMC sites!) appears as the type example the Wikipedia drumlin entry. I wonder how many of our club members have their homes on this map? Our club collection curator, Linda Schmidtgall knows all about drumlins. She lives on one! You could even say she owns one! Her home is perched partway up the southern end of a mile long, 120’ high drumlin within a swarm of several dozen between Savannah and Clyde. The drumlins just to the north of our club workshop at the Weiler home in Wolcott are a bit shorter and a bit wider that those farther south, but they are just as formidable for east-west travel. Most are forested and steep. 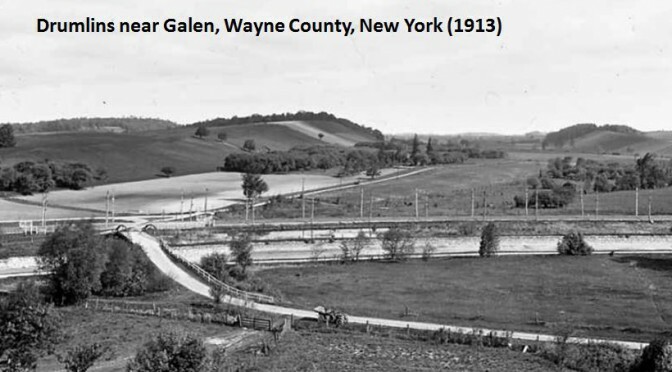 Did you ever wonder why East-West Route 104 is located where it is as it passes through the northern portion of Wayne County? Or why that route is so much easier to travel than any other east-west road? Well, route 104 more or less follows an old Lake Ontario shoreline where any drumlins that had existed would have been truncated and then eroded much as those at the current shoreline are today (witness – Chimney Bluffs State Park). It is also not a coincidence that the drumlins south of this old shoreline show a more pronounced and step morphology than those that were protected below water until more recently. No, this is not the topography on the moon. Rather, this is a 6 mile wide section of Wayne County from the south end of the 7.5 minute USGS Sodus Quadrangle map. The town of Sodus is about 3 miles north of this region. 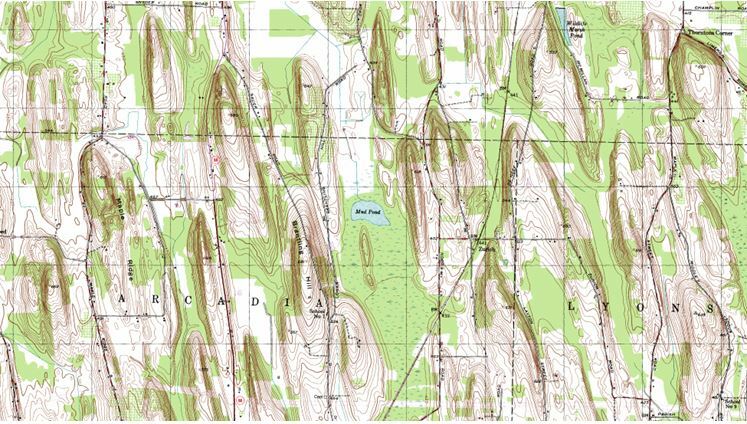 The contour interval separating each of the brown elevation lines on the map is 10 feet . Most of these mile long drumlins are over 120’ high, some are almost 200’ in elevation.